This easy grilled vegetable recipe relies on firmer vegetables like asparagus, red peppers, zucchini and onion to keep their shape and flavor during grilling, but you can pretty much use whatever type you like better. It's zesty because the marinade combines Lemon, Worcestershire sauce and Tabasco to give the veggies a bit more kick. Let the flavors of the marinade soak into these veggies at least an hour before grilling. 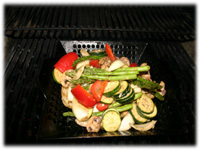 I also recommend using a grill wok found in this grilling tools page to "stir-fry" these veggies. Note, for best results marinate at least 1 hour before grilling the vegetables. Variation: try different types of rigid vegetable if any of these aren't your favorite. Tomato slices don't hold up well but small cherry tomatoes do. 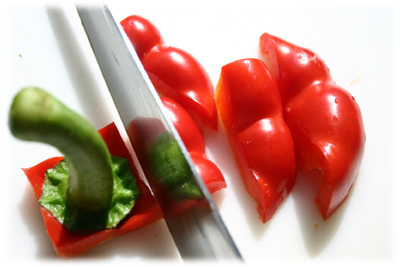 Chop or slice each vegetable except the asparagus into large chunks - at least 1" big. They shouldn't be larger than bite-size. Only trim off the larger stock end of the asparagus and leave it whole. 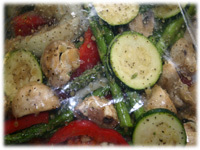 Put the cut up vegetables into a resealable plastic bag. Mix the marinade ingredients above and pour over the vegetables. Seal the bag and distribute the marinade well through the veggies. Well oil a vegetable grilling wok (spray oil works well) and place on the BBQ to heat up. When the grill is at temperature dump the contents of the bag into the grilling wok. There may be flames as some of the oil and marinade drips down into the BBQ. 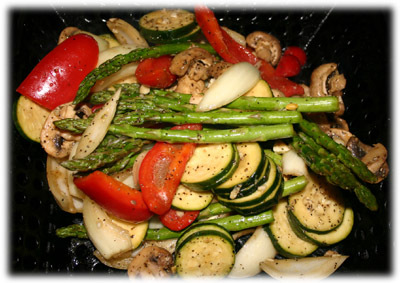 Stir-fry the grilled vegetable recipe 8 - 10 minutes just until they begin to get soft. 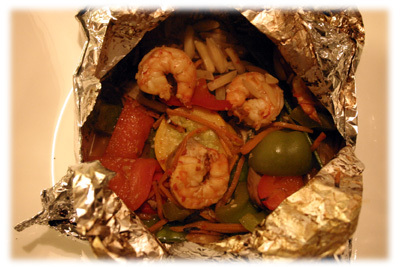 Remove from the grill (careful the wok is very hot) and put on a serving plate.